Big and juicy oranges are here! (Have been for a month now, actually. But I got (more) jobless just today). 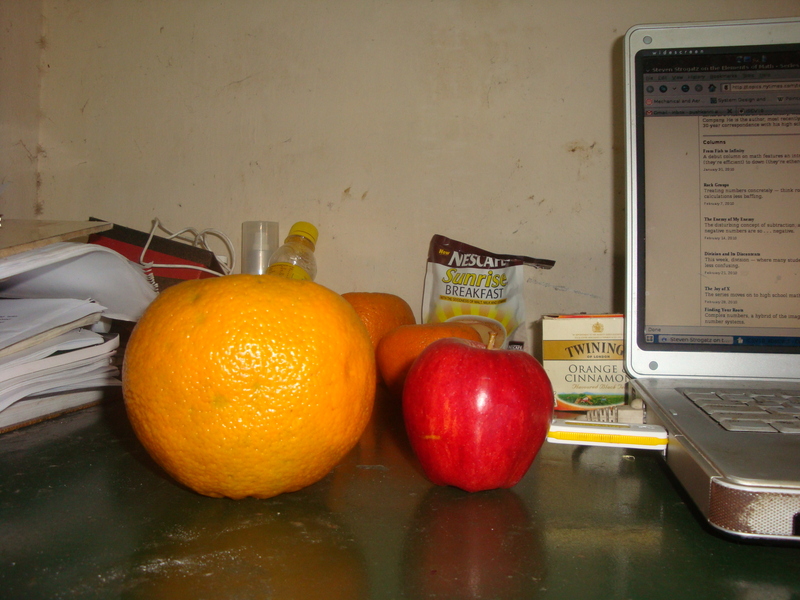 I have not seen bigger ones in my life and just to give you an idea, here is an orange sitting next a medium sized apple and my heavy and rusty laptop. Caution: The fruit shop in Gurunath sells overripe fruits at slightly higher prices. You might want to try the shopping complex or the Pazhamudhir outside Velacherry gate. I recently heard from a friend (a trusted source, hopefully) that a hostel warden in one of the new hostels in IITM allowed a foreign student to have female guests till late night, besides letting him have a party which involved alcohol consumption. I would really like to know why this exception has been made (probably over and over again) only for foreign students. Is the reason that he was leaving the country and wanted to throw a farewell party good enough? Well, so are most of us (and is it even necessary to tell you why, now..) Foreign students are exempted from paying for the food in hostel mess too, citing the fact that the food served doesn’t ‘suit’ them. Who gave these people the idea that the food served suits us any better. I remember, how my Indian friends who were vegetarians, when in Paris, had to survive on French fries many a days, because the ‘restaurant’ there wouldn’t serve anything else they could eat. I never heard of any special exemptions made for them. And I am pretty sure that meat : vegatarian is way more serious than half baked rotis : European. The institute puts harsh and senseless restrictions on students for no reason. And more often than not, they end up hurting rather than making any positive impacts. Think of all those fifth year Dual Degree students who don’t have any labs to go to ( I do :) ) or classes to attend, who have to sleep till 2 in the afternoon because the LAN is cut off till 2 so students attend classes and not surf the net. Dear Dean, or whoever you are, please check, students bunked classes not because they were sufring the net, but because they just slept off really late. And they still do, by the way. Moreover, any issue regarding the LAN ban has the same answer from the authorities: We provide you free net. We make the rules. The problem with this attitude is that it doesn’t make sense, because it doesn’t achieve anything, besides proving the point, that the people who make these rules know jackshit of what’s going on. Or probably they do. I don’t know. The post must have sounded like I have serious issues with the institute (like it even cares). Oh and I do, but having said that, I have come to call this place my home over the course of five years. That’s all the more reason why such issues bother me so much. Is anyone listening? January: In the only other pleasant month in Chennai, I started running seriously. February: I ran my first official 10km long mini marathon. I bought a birthday cake for someone special, for the first time. And for the record, I don’t believe in the cake smearing routine. Cake is too nice to be wasted like that. March: In the month where everybody around me was either placed or had an admit from a US university, it was time to be patient for another year! Nothing special happened. GRE, GATE, this. that. April: I cursed the French Consulate for rejecting my Visa. I got drenched in the Chennai summers. Some one special back home had a very hard time and I couldn’t be there for her. For the first time I felt I wasn’t doing enough. May: The word uneventful will feel degraded if I compare it with my May. Please don’t make me recall that month. June: I went to Paris and had a ball. I loved my lab, again. Cafes, wines, choirs, museums, meeting new people, cooking your own food and the list continues. I had a great time with myself. All over again. July: The list of exploits continued. BeNeLux, Suisee, Normandy, Barcelone. I realized how much I like to travel and see places. I am stupid to not have blogged about the cities I visited. August: A grandparent passed away. Its weird how I still can’t believe she isn’t around anymore. Here is a letter she wrote to me, when I was in my first year at IIT Madras. I noticed that blogging about something or someone helps you keep them alive in your heart, in some way. September: The month came and went all in one moment. I won’t call it uneventful. Partly because I (honestly) don’t recall what I did in September. November: I gifted someone for their birthday for the first time after putting in some thought in the present(yes..). I realised how thankful I am for the friends I have. December: It was time for making more friends! I loved the company of my juniors at the flight testing lab at IIT Kanpur. I saw the much admired Taj and it did look magnificent from a distance. Earlier in the month, a job offer from Airbus did good to my bruised ego. * Lately, I have been acting weird about New Year wishes. I think they are redundant, silly, etc, etc. But listing out my pursuits in the last year just did the trick I guess. I am ready for more now. Bring it on!